Glad you've joined us Smitty - I'm more on the meat side and striving to go to more meatless meals - love the flexible part of the plan! 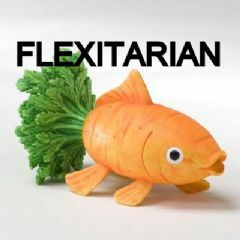 Honestly, I've never heard of a 'flexitarian' before, but it fits right in with where I'm currently at in my life. I strive to go meatless a couple days per week and would like to expand that to maybe full vegetarianism at some point. I think it would be healthier for me. I lost a few pounds before coming to SP, but am looking to lose more. Thanks for the goodie and the welcome! renewed on SP, and new to this group! Trying a whole new way!